Inspired by a recent rereading of John Updike's classic 1960's novel, Couples, Cheim & Read is pleased to announce an exhibition of that same name. 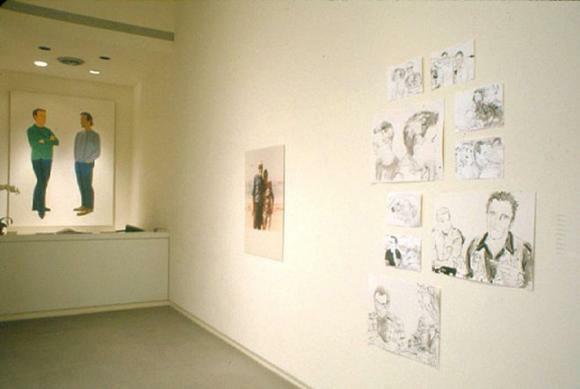 Couples is a group exhibition including the works by Diane Arbus, Louise Bourgeois, Richard Billingham, Larry Clark, John Currin, Adam Fuss, Nan Goldin, Philip Guston, Jenny Holzer, Alex Katz, Mike Kelley, Robert Mapplethorpe, Bruce Nauman, Alice Neel, Jack Pierson, Richard Prince, and Billy Sullivan. What is it that makes the "I" want to become a "We"? So much of contemporary culture urges us to couple. This exhibition looks at a number of contemporary artists that address the condition of "Coupledom." From the stand up irony of Richard Prince, the existential numbness of Bruce Nauman to the acute sensitivity of Alice Neel or Diane Arbus, Nan Goldin or Jack Pierson, the exhibition will look at the different ways contemporary artists have looked at the need for one to couple with another.